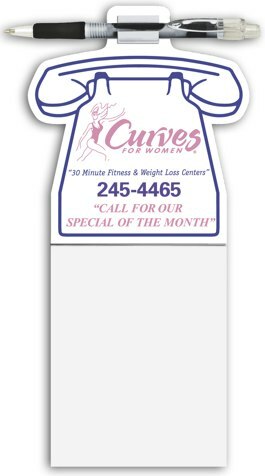 Custom Phone Pad Magnet with Pen Personalized in Bulk. Promotional, Inexpensive. Budget Prices in USA and Canada. Ideal Refrigerator Magnet. Phone Pad Magnets with 50-sheet pads and quality retractable pens. Ideal refrigerator item at the best price in USA and Canada . Free artwork design. We will send you a proof for your approval before production. • One color custom imprint on white magnetic surface. Add the amounts shown for extra imprint colors. • Gray pen with black grip and plastic clip. • Solid background requires additional color charge. Setup Charge: $30.00 per color. Production Time: 5-10 days after art approval. Contact us if you need a rush delivery. Imprint Area: 1 14/16" x 3 5/16"
Magnet Thickness: Approximately 0.030 (30 mil.) The large, thick magnet will hold easily the weight of the pad and pen.